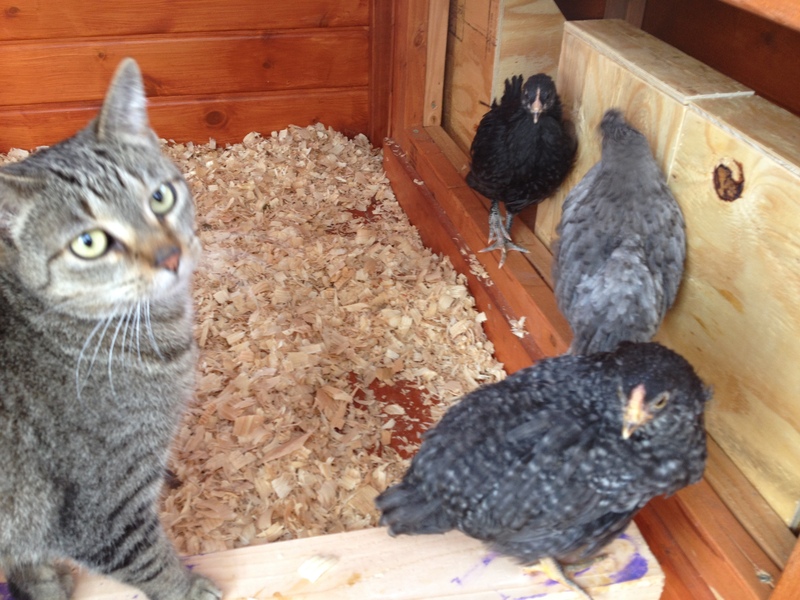 Cat Cora helps check on the chicks. I was at once excited and dreadful about putting the chicks out in the coop overnight for the first time. The temperature was to drop down to 34 degrees. I worried about whether or not I should leave food and water. Despite my worries, I’m happy to report Loretta, Nellie and Gigi made it through the night. I checked on them three times last night (the last time at 2:30 a.m.) and each time I found them curled up in a pile of feathers. I decided to leave their baby feeder and waterer in there with them, but as of my last late-night check they had not touched them. The debate rages in the chicken community whether or not to leave water and food in the hen house, or to just give them access when they are in the run during the day. When I went out this morning, they had dipped into the food, but the sun had been up for a couple hours spurring them to eat. I plan to let them out of the hen house at daybreak from here on out, so I have decided to stop leaving food and water in the coop. One exception may be to include water during the hot summer months. Mesh is installed on the big coop window. 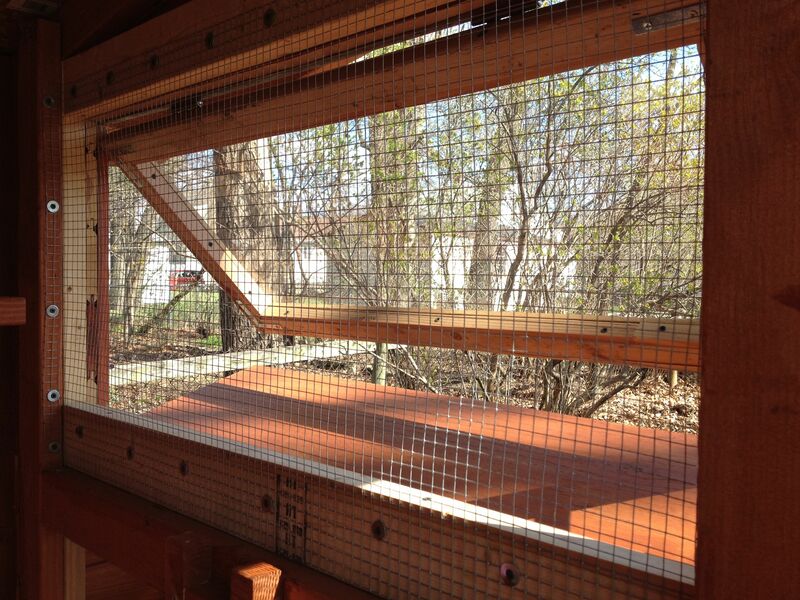 Yesterday we finished both coop windows by adding wire mesh over the openings. The task was simple and straight-forward. Construction tip: When installing mesh use a screw and a washer to hold it in place. We did this with the windows and installation was a breeze. 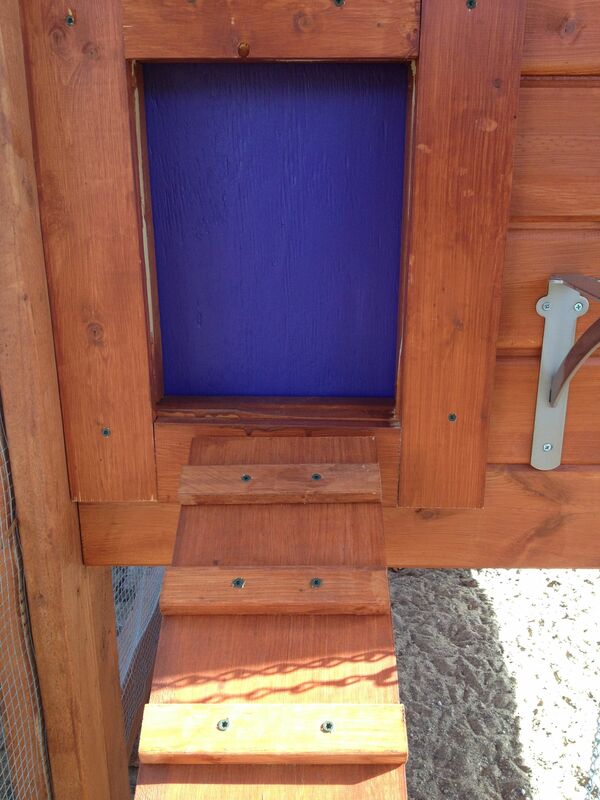 For all the other mesh on the coop, we installed using a staple gun. It was difficult at best. I also painted the guillotine door. Purple! Matt said I could pick out the color, and I was all conservative about it, looking at hues of blue and green … until Matt said, “Hey, how about purple?” I almost fell over in the aisle. Of course I would LOVE purple!! So I bought a sample size of eggplant something-or-other. It looks perfect, so much so that we decided that we will eventually paint the window frames the same color. Right now, the chicks are still in the hen house. I don’t think they have figured out the ramp yet. I saw them walk up and down a few times yesterday, but they seem to be confused by it this morning. Still, they are out there. For good. I thought I would find this moment bittersweet. But instead I am filled with happiness and relief. I’m ready to let my babies move on to the next leg of their journey. BONUS VIDEO: The girls have a romp in the sand. Group dust bath! I love the new theme on your blog. Looks really sharp! Your coop is beautiful! Thanks so much! I really love the new look, too.